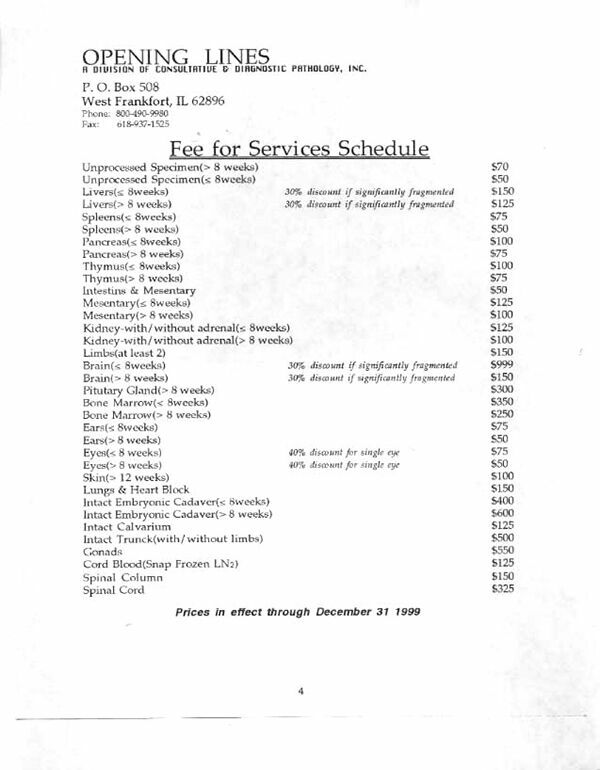 In April of 1997, Life Dynamics began a two-year undercover investigation into the marketing of body parts harvested from babies killed by elective abortions. Although marketing fetal tissue is a violation of federal law, a major loophole and a carefully devised scheme by abortion industry insiders has allowed for a profitable and growing industry in the sale of baby body parts. Using a “wholesaler,” who can best be described as a middleman between researchers (at medical schools, pharmaceutical companies, bio-tech companies or government agencies, etc.) and the abortion clinics, requests for certain body parts are made, harvested, and “donated”. In this process the wholesaler pays a “site fee” to the clinic and is reimbursed for the cost of retrieving the parts. On the surface, this is not illegal. In fact, this process is used in all sorts of medical clinics across the country for medical research. The loophole is that site fees and retrieval reimbursement amounts are unregulated. The law requires that such payments be reasonable and reflect the actual cost of securing the parts; but there are no state or federal laws which establish guidelines or set limits regarding these payments, and no one is appointed to oversee the system. What we found is typical of the abortion industry self-policing. 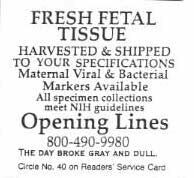 The bodies of aborted babies are now sold at premium prices and terms like “site fees”, “donations”, and “retrieval reimbursement costs” are simply code words designed to conceal the true activities that are taking place. (For more on the myth of self-regulation within the abortion industry, read Lime 5.) And make no mistake, the people involved in the trafficking of baby parts were not profit-driven infiltrators, but those who had connections to Planned Parenthood, the National Abortion Federation, or both. Additionally, we found that the women going to the participating clinics often never knew the baby’s parts were being sold or that amongst all the required paperwork, she signed her consent. Abortion clinics know that the possibility of being caught is virtually zero. When a woman leaves an abortion clinic, she has no idea what happens to her dead baby and almost no incentive to find out. Furthermore, if she decided to pursue the issue it would be impossible for her to ever determine for certain whether her baby’s corpse was thrown in a dumpster, flushed down the sewer system, incinerated, carried off by a medical waste company, or sold for parts. To this day, people ask us whether aborted baby parts are still being bought and sold. When we respond that they are, we are inevitably asked why the federal laws that prohibit it are not being enforced. The short answer is that there is no political will to enforce these laws. The biggest obstacle in trying to stop the trafficking of baby parts is the fact that the Democrats are in bed with the sellers and the Republicans are in bed with the buyers. That’s where the issue stands today and that’s where it will remain. Please Note: This report is not available in a printed copy from Life Dynamics. This investigation was made possible by our incredible donors. With your help, we are able to save babies lives and continue to expose the abortion industry. So please become a member of the Life Dynamics team and donate today!